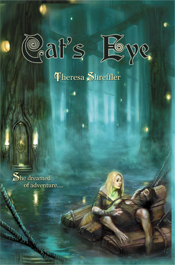 Purchase Cat's Eye on Amazon! Volcrian looked down at the body, watching the crimson tears seep from the woman's wounds. His every sense was attuned, his muscles tense, every breath quivering in his lungs along with the sweet smell of death; it permeated the air along with the blood, a thick scent full of spent panic and wasted breath. It was a smell he was used to. Slowly he knelt to the ground, and passed a gentle hand over the woman's head, saying a silent prayer over the body. His pointed ears twitched slightly as he listened to the blood dripping through the floorboards in syncopated rhythm, pooling in the kitchen below where soon the heat from the hearth would dry it. Every nerve in him was aching to reach out and touch the precious water of life, the salty liquid that bore more power than any other magic. But he wasn't here for a sacrifice. He was here for vengeance. "That's the last time you house a murderer," he whispered to the woman's corpse, then his icy eyes flashed to the corner where an equally dead man was lying. The room was a mess; the floor splattered red and the furniture overturned. The two had put up a messy, disorganized fight - but their fate had been inevitable. Volcrian's hand swept to the rough floorboards beneath him, trailing his fingers through a pool of blood. His nostrils flared, and despite himself, his thin tongue whipped out to lick his lips. The power that he drew from the blood was energizing, elating, a heady rush that made his body sing. With a hollow laugh he flicked his long silver braid over his shoulder and turned from the ruined bedroom, shutting the door neatly behind him. Couldn't have any innocent wanderers coming through and finding the bodies until he was long gone. I will always follow you, Volcrian thought in grim satisfaction. Yes, he had found the assassin's trail, and dealt justice to those who had helped the murderer. Perhaps they had not been aware of the assassin's past or occupation, but that was of no consequence; it was the code of a Wolfy mage - honor before death; vengeance without mercy. Volcrian walked out onto the landing and looked down at the sparsely decorated living room. It was a small family he had called upon that evening, middle class and hard-working. They had been eating dinner, talking about the merchant husband's coming voyage overseas. The woman hadn't wanted him to go. Well, safe to say he wouldn't be going anywhere. Ever. The Wolfy mage chuckled to himself, unsure of what had brought on this good humor after so many months of brooding. Maybe it was the fact that he had finally picked up the assassin's trail again, or perhaps the life he had drawn from the blood upstairs, or maybe that his belly was full and the future was looking bright for the first time in a long time. Whatever the reason, his steps were light, and a dangerous smile played upon his lips. Volcrian's smile faded slowly as he descended the stairs and headed for the front door. His dark blue cloak swirled around his lean form in a sudden gust of wind, but the Wolfy paid it no heed. Someone had obviously left the window open. "Mister?" a small voice asked. Volcrian paused, his hand on the doorknob. Slowly he turned around, his breathing peculiarly light, his eyes flickering around the room. Standing there near the doorway was a small child in a sleeping gown, probably close to four years old, a stuffed dolly in his grasp. Volcrian smiled again, this time indulgently. A child - he loved children. "Yes, little one?" he asked, stooping down to seem less threatening. He watched in utmost joy as the child took a tentative step towards him. "Where's Mum?" the boy murmured. "I'm thirsty." Volcrian frowned again, and he held out one pale, long-boned hand to the boy. "Your mum is asleep now, little one," he said softly. "But I'll take you somewhere you can get a drink." The boy looked at him for a long moment, then slowly shuffled his way across the room, still awkward on his feet. Volcrian felt his heart melt slightly at the sight - what a sweet child, so innocent, so young. So pure. Untouched by the cruelty of the world, seeing with unbiased eyes. Finally the boy was close enough to place his tiny hand in Volcrian's own, and the mage stood up carefully. "It's not far," he murmured, and opened the door into the night. The two stepped out into darkness. Then the mage took the boy to a water trough, sank him in, and held his head firmly under the water. There would be no one on the streets at this late hour to witness the atrocity. The small child's struggles made Volcrian's heart pound with adrenaline, and as the life was sucked from the poor boy, he could feel it energize his blood. Yes, tonight would make his magic strong, strong enough to finish his quest. The child stopped moving, and Volcrian stood back, wiping his hands dry on his cloak. He couldn't have the boy speaking of what he had seen, and anyway, it was only justice. Those who helped the Viper deserved to die. And to Volcrian's mind - the mind of a killer - he had not sinned. “But my lady, that's utterly. . . insane!" "It's not insane, Lilly, it's necessary - of all the people in this manor, you know me the best, do you think I'd take to married life? I can't do this!" "My lady, it's not about that - what if you get caught? What if I get caught? I could lose my job here, then where would I go?! And you. . . well, I'm sure the good Lord wouldn't throw you out of this house, but it certainly wouldn't bode well with your husband-"
"Fiance," Sora corrected with a sniff, and continued packing the leather bag she held in her hand, cramming it full of shirts and cloaks and other things she figured she would need for the road. Sixteen and soon-to-be married, she had woken up this morning - the morning of her wedding day - and realized that she wanted nothing to do with married life. Especially to a man I've never even met before. . . . She wasn't sure what she had been thinking when she'd agreed to the wedding some six weeks back - but the panic had grown, and today was the last day for her to act. Desperation was a dangerous thing. 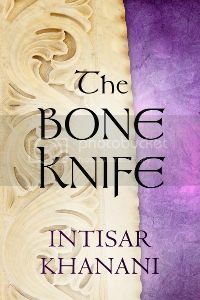 She flipped up the corner of her feather mattress to reveal a stash of gold coins, and tossed those into the pack too, along with a delicately made knife. The knife had originally been a gift for her fifteenth birthday and probably wouldn't be any help in actual battle, but it was the only weapon Sora could get her hands on in such short notice. She definitely wasn't about to go tromping about the outside world without any way of protecting herself. I might be desperate, but I'm not stupid. Lilly, a short maid with braided black hair, looked completely appalled. "I can't let you do this!" the maid hissed, and grabbed the hair brush that Sora held in one hand, trying to wrench it from her grasp. "I'm sorry, but you can't go! They know that we're friends, I'm the first person they'll ask about you, and what am I supposed to tell them?!" "Tell them you have no idea," Sora growled, and yanked the brush back from the maid, then she threw the pack on her bed. "It's my only chance, Lilly; I tried talking to Father this morning, and you know how that always goes." Sora gave the maid a meaningful look before continuing to pack various things into her bag. Her father had been so outraged that he had spilled ink on his precious land deeds. It was a predictable response from the man who had never taken a moment's interest in her life - other than living under the same roof, the two could have been perfect strangers. And of course, he feels no guilt at all, marrying me off for his own political career! Sora glared just thinking about it. She had agreed to the arranged marriage a month earlier, subdued by visions of a romantic future with her husband, every day a new adventure. . . but after overhearing a few conversations with the maids, she had realized this wasn't the future that awaited her. Days spent at home sewing or entertaining guests, raising children, imprisoned by propriety. . . it was enough to make her sick. She had her own personal ideas about how her future should be, and being forced to marry a stuffy nobleman was not part of the picture. The dreamy light of sunset flowed through the tall window to Sora's back, casting the large room in a golden glow. She paused for a moment, taking in the furniture around her and the thick carpet; the tapestries on the walls and the jewels that decorated her dressing table. It was a gilded cage, and she was glad to be leaving. The sound of a carriage rolling down the front drive drifted to her through the window, and Sora felt her heart thump in alarm. More guests? She was running out of time - without Lilly's help, there was no way that she could duck into the kitchens and grab some food for the road, or even make it to the stables without being noticed. Sora turned to her maid and tried a different tact, realizing that the girl was not going to help her without some persuasion. "Lilly, please,” she begged, grabbing the maid's hands, “You have to help me! Don't you remember the winter before last, when it snowed in and that visiting Lord took a liking to you?" Lilly swallowed hard and blushed, her stubborn face growing pink. That was enough of an answer for Sora. "You spent nights in his chamber, and did I ever mention a word, even though that Lord was supposed to be here to court me?" Lilly pulled away and turned to a stack of towels, trying to look furious. "I thought I was doing you a favor!" she muttered. "Or how about that time you spent a week with those boys in Mayville, and I didn't tell anyone where you'd really gone - they thought you were visiting your mother!" Lilly blushed even more deeply. Sora could see that her reminders were having an effect. "Then there was the day of the garden festival when you got drunk and weren't back by curfew, and the time we spied on the head maid because we thought she was going to sack you, and what about that time when-"
"Alright! I get it, you've helped me a lot! But I still don't think. . . what if you get injured, or worse. . . I'd never forgive myself. . . ."
Sora glanced out the window to where the sun was just a sliver on the horizon, its orange glow touching the hills in the distance. The trees that lined her father's huge property were casting long shadows across the giant lawn, and another carriage was pulling up the drive - not much time left. "Oh come now, Lilly, I can take care of myself!" She turned to face her maid, giving her a beseeching look. "Lilly, I have dreams I need to follow, and they're not here!" Lilly held Sora's gaze for a long moment, and finally sighed. She looked at the ground guiltily, obviously reluctant to speak, but at last her answer came out. "Alright," she whispered, as though each syllable was painful. "You're right, Sora, I can't see you married to that Lord and happy. . . you've always been the adventurous one." Abruptly Lilly rushed forward and embraced her in a tight hug, distracting Sora from her thoughts. The hug left her feeling winded yet much braver, and her resolve hardened. Yes, she could do this. I'll find a way. "Let's get you out of this dress, then," her friend muttered, jumping to the task now that she had made up her mind. She spun Sora around and began untying the laces in the back, and Sora's ribs groaned in relief as inch by inch she could breathe again. "Then I'll just nip down to the kitchens and grab whatever food I can find - I don't want you going hungry on the road. Gods, I don't know how we're going to manage this one, there are already so many guests here!" "We'll find a way," Sora murmured. "I know we will." We have to. Half an hour later Sora found herself out of her dress. It had taken hours to put on in the morning, but Lilly had ripped the thing off of her with little care. There was no time to undo her hair, which was still styled fancily atop her head, but the face paint was washed off and Sora threw on a practical shirt, breeches, and boots - her everyday outfit if she could get away with it. Now Lilly left to retrieve some rations from the kitchens for Sora's trip, and Sora turned back to the window as her maid shut the door behind her. It was almost dark now. She felt no fear from what she was about to do, though she was terribly nervous. Sora knew she wouldn't miss her manor, it had always been more of a prison than a home anyway, and the thought of leaving her father evoked even less of an emotional response. They were about as distant from each other as two people could be. However. . . what will I do once I leave this place? Where will I go? She had no map and no sense of purpose other than that she wanted to get away from the manor as soon as possible, but something was nagging at her. It was an idea that had occurred to her several times over the years, but now she had the time to consider it realistically. What about my mother? Sora had never known her mother, not even the vaguest infantile memory. There were no portraits or records of her around the manor, and most of the staff acted as though they knew nothing of the woman's existence. Sora knew it had been by her father's orders that her mother was never talked about, but she dared not to approach her father on the subject - the one time she had tried, the results had been disastrous. Sora went to the small jewelry box that sat on the nightstand next to her bed, flipping it over and pushing aside the bottom panel, which was loose. There was a small space on the underside of the box that Sora used to hide various items from the maids, but no item was as personal as the one that fell out into her hand. It was a necklace - a small, marble-like stone that hung from a thin silver chain, opaque and green-glinting in the sunlight. Sora held the stone up before her eyes as she had done a thousand times before, staring at the strange yet beautiful golden swirl that rested in the center of the sphere. She clasped the stone in her hand; it always felt slightly warm to the touch. She had never showed it to anyone, not even Lilly - it was sacred to her, an artifact of her past that she may never be able to explain. Sora had found it long ago when she was a little girl; it had been a particularly cold winter and she hadn't been allowed outside, so had spent the time roaming around the manor and exploring all of the places she normally wasn't allowed to go. After having been chased out of the kitchens and cellars for the hundredth time, she had found her way upstairs, all the way up into the little-used attic. Usually the door was locked, but some servants had been cleaning earlier that day and had left it open. Wandering inside the cold room, the nine-year-old Sora had found her way to the farthest back corners, where she had started sifting through old boxes and chests. Most of the boxes had contained her father's business records, but deep at the bottom of one box she had found something peculiar - a bulging yellow envelope, and on it, written in twisting black script, had been her name. In excitement Sora had ripped open the package, only to find the necklace awaiting her inside of it, along with a small, quickly scribbled note. Hopefully a time will come when I can explain to you all the reasons why I left, but for now, know that I love you only as much as a mother could - you are always close to my heart, and I pray to the six gods that I will be close to yours and that this letter is delivered safely to your hands. I leave you this necklace so we might know each other when, gods willing, we meet - do not wear it, but if you do, wear it until the day when we can be together. In your heart, promise me this. The letter had ended, saying so much yet so little to Sora's questioning heart. She had done as her mother had said and not worn the necklace - she saw it as her mother's last sentiment and a promise that somehow connected them across time and space. But now, staring at the stone and watching its secretive light. . . Sora felt a sudden urge grow within her. Her mother had given her this necklace along with a promise of love and acceptance, whenever and wherever the two of them might meet. Now that her life was changing, Sora wanted more than a promise to connect them - she wanted to be with the only person she had ever considered family. The only person who, despite never meeting, she felt closest to. 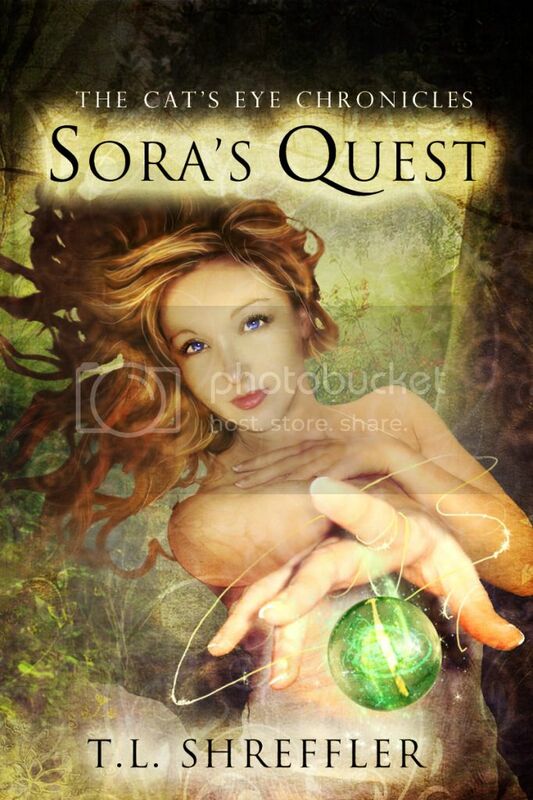 Sora unhooked the necklace and fastened it around her neck, hanging it firmly in place. This would be her quest - to find her mother, and she would not remove the necklace until they were reunited. Sora spun around with a gasp, quickly hiding her necklace under her shirt and forgetting the odd sensation. "Lilly! Gods, knock next time!" "My lady, I'm sorry, but it's urgent!" Lilly rushed into the room and slammed the door shut, quickly locking it. It was only then that Sora heard the sound of rushing footsteps out in the hall and the distant shouts of voices. She glanced out the window - night had fallen completely, where had the time gone? "Urgent?" Sora frowned, now beginning to wonder at all the commotion outside. "Why urgent? What's going on?" By the gods, I hope it's not the groom's arrival, anything but that! "There's someone in the manor," Lilly's eyes were wide and her voice hushed. "Someone who's not supposed to be here!" Sora frowned even more. "So?" Lilly rushed over to her, quickly pushing a heavy bag into Sora's hands. Then she looked up desperately into her face. "Sora, they're saying your father's been attacked!" Sora blanched, for some reason unable to understand what Lilly meant. Her father? Attacked? "What do you mean?" "Aren't you listening to me!" Lilly turned and was now moving around the room frantically, as though she didn't know what to do with herself. "It's all mayhem out there! They found your father at the bottom of the stairs from his office - at first they thought he'd fallen, but gods, there was blood-"
"Wait - no - you can't be serious," Sora felt shocked. "What do you mean, blood? Attacked? No, that's silly! He probably just fainted in all this damned heat!" It was still very warm even though night had fallen. . . maybe her father had just fainted, hit his head on something. . . in either case, there was no way that the wedding was going to be canceled. A sudden, feverish glow lit Sora's eyes - this could be her one chance to escape unnoticed! "I don't think this is a good idea, Sora," Lilly said abruptly, coming to a stop a few feet from Sora's bed. The maid turned to face her mistress, looking worried. "He could be seriously injured, and if you're not here. . . ."
Sora felt as though the world was becoming very small. She became oblivious to the room around her as her thoughts narrowed, and she found herself clearly presented with two options. She could stay, find out if her father was all right - actually show some concern for a man who had never cared about her - and then proceed with the wedding after everything settled down. Or she could take advantage of all the confusion, and run. And what about finding my mother? Sora gripped the stone necklace through her shirt - she could feel its warmth through the fabric. No, she couldn't turn back now. "Lilly, you can't stop me - I'm going!" Her maid's face had turned white, her dark hair and eyes making her appear almost sickly. "But my lady-"
"Get out of my way!" Sora grabbed her bags and rushed past her maid, shoving her to the ground when Lilly tried to block her from the door. "You'll never make it!" the maid screamed after her, but Sora was already in the hallway and slamming the door behind her. Lilly sat in the middle of the room, shocked and staring after her mistress, unsure of what to do. And so, figuring that the gods would have their way, she slumped helplessly and did nothing.